I have two stories out today on this weekend's Rock, Paper Scissors national championships here in Vegas this weekend -- one for the Boston Globe and one for the Chicago Tribune -- and I'm leaving the house now to go cover the event for Monday's The New York Times. Yes, Rock, Paper, Scissors is getting its close-up. There's $50,000 and a free car at stake at the thing at Mandalay Bay. Will probably use some audio on next week's "The Strip," too. These people take this stuff very, very seriously. Well, some do. Others are just here to enjoy their free Vegas weekend. Gotta run. After that, I'll stop in at the Gay Pride festival at the Clark County Government Center today. Miles hates that stuff, won't go with. Will report back later with impressions. "The Petcast" is LIVE right now! Join us in the chat room right now from 9-11 am PT for the live version of "The Petcast." Don't miss the chat with the folks who, uh, ballroom dance with their dogs! So the marquee is up, as previously reported. But down a the bottom is the catch. Click on the image to read the fine print. Very cute. We hear it's some sort of promotion for the hotel-casino's new buffet. 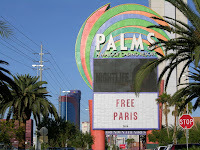 Miles text-messaged me to let me know there's a marquee at the Palms, where Paris Hilton loves to chill with her pals and owner George Maloof, that reads: "Free Paris." Will get a photo for the blog later today when I'm on that side of town. Reminds me a little of the folks who wrote "Free OJ" in masking tape on the top of their mortar boards at my graduation in June 1994 from Northwestern, the morning after the famed OJ car chase. 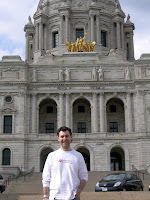 Chris Albrecht: Do You Know Who I Am? It's not every day an act of violence in Vegas ruins someone's career. OK, it does happen aplenty -- Adam "Pacman" Jones can attest to that, too. 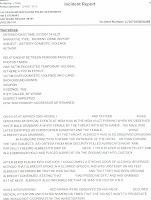 But here to your right is a copy -- click it to make it readable -- of the narrative of the Las Vegas Metropolitan Police report from the domestic battery charge against HBO CEO Christopher Albrecht a few hours after the De La Hoya-Mayweather fight at MGM Grand. Took me all day at police records to get this thing on behalf of Newsweek (see our story here) but they didn't post the actual report so I figured I would. Albrecht's girlfriend's name was redacted as was the officers involved. But according to this, not only did he grab her with BOTH hands around the neck and try to drag her toward the door from the valet area. The guy had to be very drunk but also full of hubris having just produced the most profitable fight in history to do something like this in plain view of probably hundreds of people. What's even better is the quiet line in here that he told the officer he was the CEO of HBO. Does it EVER work to tell the cops you're someone important? Didn't he ever hear about Mel Gibson? This seems to prove to me that these are just typical Vegas stereotypes. The guy was the top dog at the network that just staged one of the biggest events of the year. The girlfriend was busy insisting nothing had happened and that she wouldn't cooperate with an investigation. And STILL they arrest the guy. Still think the cops are in bed with the casinos? To those of you who made it into the chat room for tonight's live version of "The Strip," we had an Internet outage at LVRocks.Com. That's kind of a bad thing to have happen at an Internet radio station, but the GOOD news is that it did not impact the recording of the show. So the podcast version will go up on Thursday! Next live show will be back to Tuesday night at 7 pm PT at LVRocks.Com. Come join us. Exhibit 1: Wynn set up a booth last Friday at First Friday in the downtown Arts District to give away vouchers for 500 seats to first comers. Giving them away! Yikes. Exhibit 2: I stopped by the half-price ticket counter in the Coke bottle across from the Monte Carlo on Saturday afternoon after trying (and failing due to the MGM Mirage systemwide sportsbook glitch that the mainstream media entirely ignored) to place my losing De La Hoya-Mayweather wager. 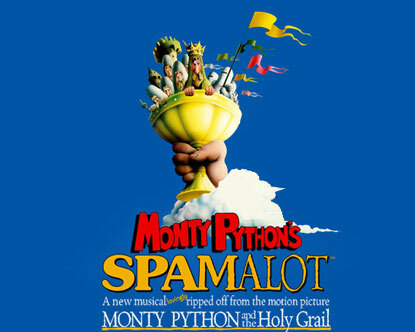 Spamalot tickets were available at half price, for $66. This was a big, big weekend in Vegas and this was a Saturday night and the show can't sell out? I still predict Wynn will keep it open at least a year regardless of the cost so as to not declare it a total failure. While I was at the Coke bottle, by the by, I took note of who else was offering half-price seats on a very busy Vegas night. Mamma Mia had $50 seats, the self-proclaimed "New Mr. Las Vegas" George Wallace was up there for $40, Le Reve was available for $80 (not quite half-price, actually) and poor old Carrot Top was on sale for $20 a stick. Is it time to start wondering if the Vegas show industry is in trouble? It was an unexpectedly thrilling visit and here above to your right is the money shot. Unlike the lackluster Juneau building, this one was absolutely an amazing piece of art and history and governmental symbolism. It was quite large, has a huge and beautiful rotunda and was designed by the same fellow who designed, among other structures, the U.S. Supreme Court. Every inch of it was carefully thought out, from the moulding to the stonework to the way that visitors are greeted by a fellow in a black tailed tuxedo and top hat. Yes, really. 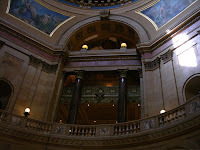 We got an earful from a lovely volunteer named Margaret who knew a zillion interesting -- and, truth be told a few uninteresting -- anecdotes about the building, the state's history and even about its comparisons to certain other statehouses. They had info sheets with histories of all the famous quotations on the walls and about each of the form of rock. 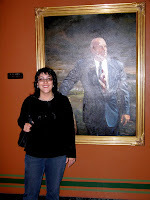 I got Melissa to pose with Jesse Ventura which is good considering that Jesse's too shiny for you to really see. So you may be thinking, 'What a dork.' And I do plead guilty. But before you condemn me, just look at some of these photos. And then check out this blog I just discovered where a couple somehow hitchhiked to 50 capitals in 50 days. I'm not quite sure how that's possible -- hitching to Hawaii??? -- but I'll take some time when I'm not running low on laptop battery and read further. Because I'm away, we're recording the show live tomorrow night. We'll have a newsworthy interview with magician Steve Wyrick and a special interview edition of the Top Secret Tourist Tip of the Week. Join us at lvrocks.com Wednesday at 7 pm PT or wait till the podcast is up on Thursday night. Do the casinos fear that the story of the bombing murder on the Luxor Parking lot yesterday will be bad for business? In any other city in the U.S., the authorities would have media crawling all over them if someone set off a bomb in a parking lot. Are Las vegas media going to allow this to be suppressed? Have they really lost perspective and see it as a non-story? Have they been merely subdued? Now, I'm no stranger to critiquing the media, so believe me when I say that the media was all over the Luxor, MGM Mirage and the Metropolitan Police yesterday. Newsweek, in fact, sent in a stringer to Vegas from L.A. because I was out of town. It was played large on the front page of the Review-Journal as it should have been. So I don't really understand the question. I think what we have here is an unusual murder in an unusual location, but I don't think there's that much more to it. And interesting how if the media is careful not to sensationalize, they're accused of wimping out. A bomb went off, a man is dead, there's one witness, the cops are working on it. There's only so much the property can say -- it's not their fault or their investigation, it's the cops and ATF -- and from what I can tell, the MGM Mirage folks are painstakingly answering every phone call and email. In fact, one of my sources emailed me just to make sure the Newsweek stringer was legit and not someone pretending to take my place. While you may think that the media would be more aggressive if it was, say, in the parking garage at the Hancock Building in Chicago at 4 a.m., I tend to doubt it. You do with what you have. The flip side of this is, if it had happened in a parking lot in Henderson, Nev., you all would probably never have heard a thing about it and Newsweek surely wouldn't have sent someone to fill in for me. Not to mention, if it was a shooting or a stabbing in the Luxor lot, it wouldn't have been much of a thing, either. I could be wrong. But I can't see where anyone's acted inappropriately in all of this. That said, looks like I'll be offline for most of the day. What Does This Mean...And Other Denver Airport Mysteries! The Luxor bomb disappointed the media in every way -- it wasn't terrorism OR a mob hit. Just an odd murder case, but not one of national importance. But I missed a solid payday by being away. By the time I reached my layover in Denver, I had messages from Newsweek and Reuters asking for coverage. Oh well. Meanwhile, the Denver airport was full of mysteries that I need your help to unpack. First, take a good look at the image to your right. OK, it's really hard to see. But what it is is a phrase I found embedded in the floor. It says "TSE YE GO AN YEH DAA NYOT." I've Googled that and all I came up with is another traveler perplexed by it. So, anyone who can come up with something really enlightening here is welcome to any prize on the prize list at TheStripPodcast.com. Come on, folks. Next up, what the heck is this to your left that I found in the middle of a series of interminable terminal hallways? Some sort of queer-meets-Chinese public art display? All around major Chinese cities you'll find rainbow strings of neon lights much like this. Why is this here? Is it supposed to be decorative? And finally, not so much a puzzle as a fascination. The bathroom doubles as... a tornado shelter! I'm baffled by this because, as I suspected, there aren't many tornadoes in Denver County. Just 13 since 1966 and not a single one in 14 years. So why? And wouldn't that have to be just a monster of a tornado to blow clear into the middle of a building that, presumably, is fortified to withstand an awful lot of force. I might have blogged this earlier but both DEN or MSP charge through the nose to get online. Another underappreciated reason to love McCarran: Free Wi-Fi. Gosh, I miss home. On the mammoth line to the D-Gate at the airport just now, I overheard a fellow say there was a bomb exploded at the Luxor. Miles texted me to say it was just a suicide bomb/revenge thing, not terrorism but there's one person dead. As I'm on a flight in a couple minutes to Minneapolis for two days for a personal thing, I wondered how bad it was and whether I should cancel. Decided not to on Miles' advice but then the New York Times just called asking me to cover it. I can't, am going to MSP, but will be interested to see what this turns out to be when I get there. Until then, folks, think of me in the skies. She wants her placenta - and to eat it, too! This morning I woke up disappointed that I lost my $40 bet that Mayweather would KO De La Hoya and depressed to read in the morning paper that our entire food supply is in danger because honeybees are dropping like, uh, flies, and the Dead Sea is evaporating before I ever get to try to float in it. But what really freaked Miles and me out this morning was this Review-Journal piece by Annette Wells about a Las Vegas woman who is very, very upset because Sunrise Hospital refused to allow her to keep her placenta following the birth of her daughter last month. And what, pray tell, does she wish to do with the thing? "Selander washes the placenta, steams it, slices it and places it into a professional grade dehydrator. It is then ground up into a powder and put into nongelatin capsules."